On Friday the 26th of November 1920, Patrick Loughnane, aged twenty-nine, and his younger brother, Harry, aged twenty-two, were labouring in the fields near their mother’s home in Shanaglish, County Galway, carrying out the arduous work of threshing corn for the autumn harvest. With them were a dozen or so neighbours, families working together as a cooperative during the late farming season, gathering and feeding corn into a hired, steam-driven threshing machine. While their siblings had left the region to find employment elsewhere, some emigrating to the United States and Britain, the Loughnane boys had stayed with their widowed parent to tend the family’s small patch of land in the west of Ireland. Patrick, a fine athlete and hurler, was the elected head of the local cumann or party branch of Sinn Féin while his studious, bookworm brother functioned as it’s secretary. Both men were also serving volunteers or citizen-soldiers of the insurgent Irish Republican Army, the older brother becoming a company commander in the local parish of Beagh. Though their unit had seen relatively little action in the proceeding two years of resistance against the United Kingdom’s military and civil forces on the island, Patrick had participated in the Castledaly Ambush near the town of Gort on the 30th of October 1920, when one member of the Royal Irish Constabulary (RIC), the UK’s omnipresent gendarmerie, was killed and four others were taken temporary prisoner. In response the RIC had murdered a local woman, twenty-three year old Ellen Quinn, who was heavily pregnant at the time, in the area of Kiltartan and burned a number of houses and outbuildings. Just after 3pm at least fifteen members of D Company of the Auxiliary Division of the Royal Irish Constabulary or ADRIC, a mercenary contingent of ex-British military officers attached to the RIC, raided the farm in an armoured truck. Unaware of the approaching vehicle due to the racket of the threshing machine the brothers, their mother, and several neighbours were seized at gunpoint by the “Auxies“, led by one Thomas Francis Burke, a platoon commander or “3rd Class District Inspector“. With the ex-soldiers was an officer of the regular RIC stationed at the police barracks in nearby Tubber, who identified the captive Loughnane boys as “Pat” and “Harry”. Patrick was taken by several of the uniformed gunmen to his family home to fetch fresh clothes, emerging some time later with a bloodied mouth while his cousin, with the surname of Healy, was instructed to run for it. When he did so the RIC officers opened fire but he managed to escape death despite the bullets whizzing pass his head, falling into the fields a short distance away. The brothers were “arrested”, bundled into the back of the steel-plated lorry, where they were soon joined by another man, Michael Carroll, from a follow-up raid on a farm near Tubber, who was repeatedly pistol-whipped during his hurried interrogation. Eventually all three were taken to the substantial RIC barracks in Gort. While Carroll was to spend the next year in the notorious Ballykinlar Concentration Camp in County Down, the Loughnanes were doomed to a far grimmer fate. For the next few hours some fourteen RIC men took turns beating the brothers in the cells at Gort, the officers fastidiously stripped to the waste to protect their uniforms from the blood they were spilling. When they grew bored of this sport they carried Patrick and Harry outside and attached them by ropes to a truck filled with jeering constables, forcing the duo to run behind the vehicle as it drove away. When the brothers could no longer run they were dragged for eleven kilometres along the winding country roads to the paramilitary police base at Drumharsna Castle, a lonely 16th century towerhouse near Ardrahan, County Galway. Their bodies already torn and mutilated, the Loughnanes were subject to hours of further abuse inside the cold stone walls of the Elizabethan fortification, their screams audible to veteran constables occupying the base with their Auxiliary colleagues. Around 11pm the siblings, barely alive, were taken from the castle to the nearby Moy O’Hynes wood, where they were executed. On Sunday morning, the Auxiliaries removed the bodies to Uamhain Bhriste (Owenbristy), an isolated spot closer to Ardrahan, where they were set on fire. Not content with that, the corpses were then thrown into a nearby muddy pond, used to water cattle, which they polluted with engine oil to discourage the animals rooting up the remains. On the 5th of December 1920 the bodies of Patrick and Harry were discovered by Michael “Tally” Loughnane, a cousin, and his friends, Michael and William Hynes, in the pond. The RIC had claimed that the men had escaped from custody some time earlier but no-one believed the reports, and locals had organised their own searches for the pair, certain that they had been murdered by the police. Eyewitness accounts, supported by a doctor’s examination, reported that the corpses of both men were unrecognisable, their limbs broken, fingers missing, flesh flayed off, and partially burned. The doctor stated that to him it looked like “…hand grenades had been put into their mouths and exploded“. Following the discovery at Uamhain Bhriste the mutilated remains of the Loughnane boys were moved to Dungora, near Kinvara. Photographs were taken of the bodies in their coffins, traumatised relatives and neighbours standing around them in a tight, almost protective huddle. 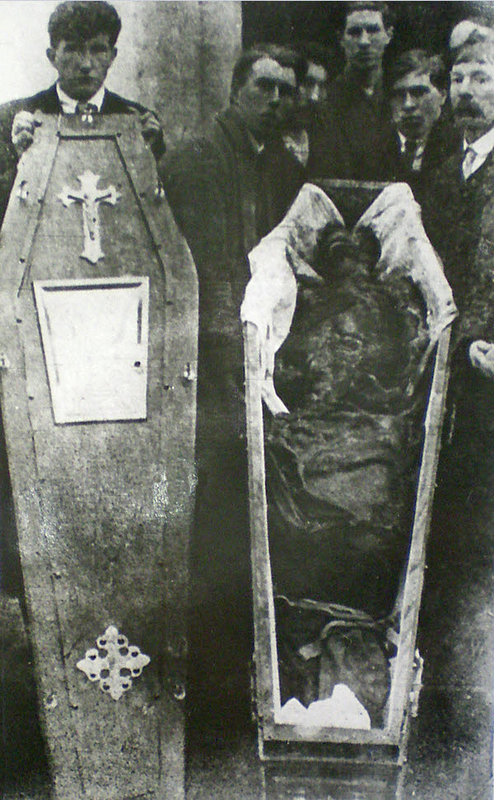 The corpses were later transferred to the parish church of St. Anne`s, in Shanaglish. There the coffins were draped with the Irish tricolour as hundreds of mourners gathered from local parishes, defying the threats of the British authorities. However, even then the small rural community was denied any respect or dignity as the RIC raided the funeral, opening the coffins and examining the contents before leaving. “[Gilbert Potter] …was an Irishman, born and reared in county Leitrim. He had four children and he worked as a district inspector for the Royal Irish Constabulary in Tipperary. In 1921, he was captured by the IRA and executed. 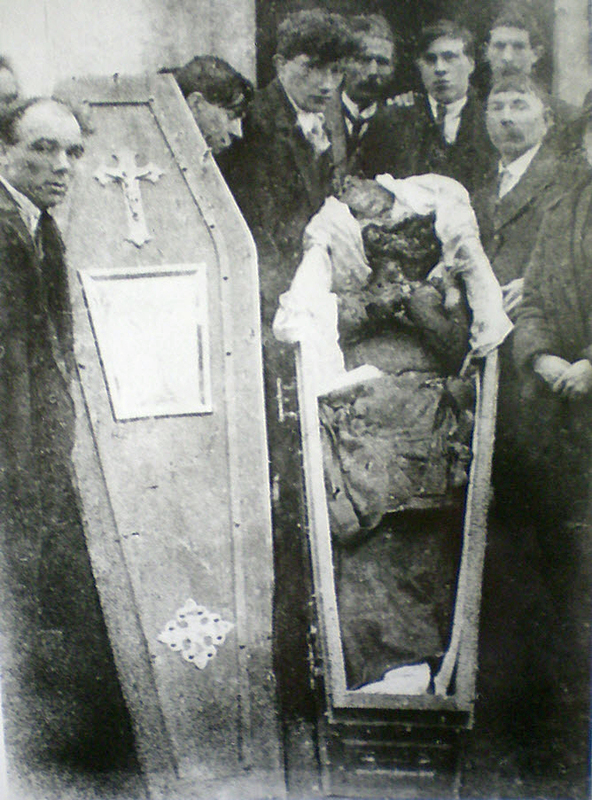 He is one of 46 policemen killed in Tipperary during the War of Independence. In four bloody years of conflict, almost 500 RIC officers were killed and hundreds more injured. In a new book, written by an acting garda sergeant, tribute is paid to some of these men who, before now, were forgotten, confined to the footnotes of the history books. Speaking to TheJournal.ie, Sergeant John Reynolds, who is based at the Garda College in Templemore, said Potter was a “very nice man by all accounts”. “He was an Irishman, and the vast majority of RIC officers were Irishmen,” Reynolds said. The Soloheadbeg Ambush in 1919 is generally considered to be the start of the guerilla war, but little is ever said about the lives of the two men who died that day. Constables James McDonnell and Patrick O’Connell, both Irishmen, were escorting a horsedrawn carriage from the military barracks in Tipperary when they were attacked. Let us be clear. The Royal Irish Constabulary, in whatever form and at whatever time, was the enforcer of the UK’s administrative rule over the entirety of this island nation and its people. From the 19th century to the early 20th century, it was the domestic equivalent of the Milice française, the police force of Vichy France in the 1940s. Regardless of the nationality of its officers or their motivations, the RIC was a key component of the British Occupation Forces in Ireland during the revolutionary period of 1913 to 1921 (and beyond). The killing of its members was not “murder”, however much the modern negationists, the apologists for British rule in this country, may wish it were so. Furthermore, the Garda Síochána, our unarmed, civilian police service, has no association and shares no lineage with the RIC. That line passes down through the infamous RUC and its reformed replacement, the PSNI. The Gardaí are the legacy of the volunteers of the Irish Republican Police and Army, not the bloody-handed killers of Pat and Harry Loughnane. Note (with thanks to Éamon Ó hÉilidhe): Harry Loughnane was baptised “Henry” but seems to have been universally known as “Harry“. Take a deep breath. Never forget. It’s typical of the period, unfortunately. Beautifully written and so infuriating. How they were treated is beyond inhuman. So are you saying that if you murdered a ´guard´ today and were later caught, his fellow officers wouldn´t kick the shite out of you in a back room somewhere if they got half a chance? C´mon Séamas, cops are cops regardless of the regime they serve, they´ll always be ready to lie their arses off to back each other up etc. Goes with the territory, ´normal´ folk have no desire to ´police´ their neighbours, it takes a special kind of personality. And of course in a war all the inherent nastiness is turned up several notches. So who started the war/armed rebellion? And why are you bringing this up now? What point exactly are you trying to make? Very disappointing to see such a juvenile overgeneralisation coming from you, Marconatrix. Not too long ago here in Ireland, Tony Golden, an unarmed Guard, faced down a guman who was in the act of shooting his partner. The Guard was shot and killed, but the gunman’s partner survived her injuries. He gave his life for her despite her being somewhat of a stranger and her having been quite unappreciative of the police service in the past. Police officers all over the world risk or make that sacrifice every day quite unconditionally (not a job for me). It does take a special personality to do that, especially in light of the risk, generally a poor salary, and the disdain of the many, who, quite frankly, don’t think far enough to see the importance of that service in terms of their very own precious welfare. Sure, there are those that give their profession a bad name by abusing their power and the public trust,just like people in any profession. Priests, teachers, journalists, actors, authors, film producers, just to name a few other recently so-sullied career paths. In most Western countries, they are the exception. They are generally caught and at minimum, fired, if not charged and convicted. Other cops catch them and build the case against them. If everyone was lying all the time, we would probably never hear of it. Sometimes they get away with it longer than they should because of the level of evidence needed to generally succeed in a conviction, but most of the time the system works, at least in the so-called “free world.” The problem here is that someone (who by virtue of their employ should really know better) is lumping in the enforcers of a repressive militant occupying power, who answer to no one but their own ilk, with properly vetted, authorised police officers, who are indeed subject to the scrutiny of those who they police. Kind of like honouring members of the East German STASI or the Nazi Gestapo along with the modern German criminal police (CID as it is known in England). It is just not right. Just like the commemorative wall honouring the murdered children of 1916 along with their killers is not right. As for who started the rebellion – really? Over 800 years of malicious occupation and deprivation of basic human rights forced that. A deprivation often much too cheerfully committed by the members of the RIC. Marconatrix, the post was in response to the book’s promotion on thejournal.ie, a website which should know better (though it has previous form in these matters). Apologisms for the RIC, and by inference the British Forces as a whole, during the pre-independence period need to be tackled head on. To quote my pompous self, they who control the past also control the present. That is the crux of the matter here. People attempting to rewrite the history of Britain’s colonial rule in Ireland, to soften the edges, excise the nasty bits, emphasis the positive, hide away the negative. It’s the equivalent of Boris Johnson and his ridiculous attacks on Barack Obama because of the president’s supposed contempt for the British Empire. As if any other sentiment were appropriate for that evil? All of the above is especially true in the age of the internet when lies become truths simply through popular repetition. THE GRATEFUL NATIVE: BRITISH EMPIRE PROPAGANDA IN THE INTERNET AGE. Er, four Garda commissioners had fathers in the RIC. Many RIC men were republican sympathisers: how else could Mick Collins have evade capture so long? Eamon Broy. Look him up. Sean O’Fiollan’s father was in the RIC. As was the father of Tom Barry: as was the uncle of Ernie O’Malley. Sure, the RIC did some bad things: so did the IRA: so did the Free staters after 1922: so did the Irregulars during the civil war. It was all a long time ago. Time to move on I think. An oversimplification of the situation as regards the RIC and the Auxiliaries. Read Liam McNiffe’s book – “A History of the Garda Siochana” worth a read. My maternal grandpa was an IRA man from Antrim who moved south in 1922 and joined the cops: had Garda badge 23: his brother had badge 24. My father had two uncles in the RIC – who ended up in the Hong Kong police. Their brother became a Lt Comm in the Royal Navy. The whole thing has a touch of the nazi concentration camp guard’s dilemma. Hard to walk in those shoes. To be fair the RIC came out of the Tan war with a far better reputation overall than could have been expected. To their credit they were generally acknowledged as having drawn back from the savages sent over to terrorise us. I suppose that’s why so few were targeted when they were easy marks at the beginning. As for British army retaliation, there’s a long line from Butcher Cumberland to Bloody Sunday to show that it’s semi-legitimate. Thank you for highlighting the bravery of the men like the Loughnane brothers who fought for Irish freedom – and the kind of scum they were up against enforcing British colonial rule in Ireland. Marconatrix’s post is a disgrace – especially from someone who claims to support the struggle for independence of small nations. He comes across as an apologist for the British Empire. The Gardai may not have any lineage with the RIC, but they still enforce a British Legal system over here that was never changed. So while we may claim the Gardai as our own the lineage of the people within the RIC still remained Irish, it’s safe to say not all were English and the ones that weren’t, you can be sure were local to the areas they were posted in. Fair point. The Gardaí did take on some RIC structure and personnel, but institutionally it owed more to the IRP. That said, the account of Tans and Auxies turning up in Garda ranks in the 1920s and ’30s are pretty depressing. 1922-23 truly was a counter-revolution. Thanks for that. I’ve just checked through the historical evidence and most references use “Harry” Loughnane with a handful of “Harold”. Only a couple of “Henry”. Was Henry the baptismal name and Harry a nickname? Both the baptism and his birth certificate state Henry. He is also listed as Henry in 1901 http://www.census.nationalarchives.ie/pages/1901/Galway/Beagh/Derry/1383718/ and 1911 census http://www.census.nationalarchives.ie/pages/1911/Galway/Beagh/Derry/902800/. It seems Harry was his nickname. I have never come across Harold yet. I have started looking into researching IRA members from Beagh parish lately and am womdering if there are any resources you have come across which may be helpful? So far I have been using newspaper reports and the military pension files available on the militaryarchives website. I would be grateful for any pointers you may have. I really enjoy your blog, keep up the good work! Thanks, Éamon, I will amend now. Great to get it correct. The BMI makes reference to Beagh but I will look through my books and saved docs to see if I can find anything. Most RIC men were good Irishmen it was the ex servicemen who infiltrated the ranks of the Auxies & B&T’s who have it such a reputation. But then again the Republicans forbade people to join RIC. So let’s get some facts here instead of demonising good law abiding men. I must say I read your articles regularly alll good apart from this smear on the RIC which many of my ancestors were in – 2 later joined the IRA. Where is the prof for that, though? The RIC officers were members of a colonial police force upholding colonial rule. Yes, some were just ordinary men looking to feed themselves and families, in search of secure livelihoods and pensions in straitened times. As the French say, no one who has not lived through an Occupation has the right to judge the actions of those who have done so. However, at some point, judgment must be made. The RIC, on the scales of historical judgment, are on the wrong side. Well I think that individual men – not Blavk & Tans who perpetrated attack above – should be remembered. And the Garda Siochana inherited the early rank structure of the RIC. Would you agree that it was really up until 1919 Independence War where RIC members were targets. I would say most of regular RIC policemen who did uphold law and order in relative peace were Nationalist by outlook – and yes there is the proof. Yes, but the RIC and its antecedents were instrumental in suppressing the Tithe War, Young Irelanders, the Emancipation movement, the Land War, the Fenians and so on. They upheld colonial rule to the advantage of the colonial rulers. Its all well and good saying, oh yes, but they were actually nationalists in British uniform. So what? Where’s the proof? They acted as the British gendarmerie in Ireland. Their contemporary actions condemn them not modern interpretations of what may or may not have been in their heads. These are the same excuses people make for the Vichy regime. They were actually patriots doing the best they could in a bad situation. The RIC were a 19th and early 20th century Milice française in Ireland. A professional Policing Body had not even been established by 1829 – Daniel O’Connell’s Emancipation Campaign. Tobert Peel who like Gladstone attempted to address some grievances on Ireland included people like Thomas Drummond to introduce reform. And that’s how the RIC became a predominantly Catholic police force. But just because the those who served in Ireland with a British or unpopular uniform on does not necessarily mean oppression. Yes, but the RIC was seen as part of the line of Crown forces, army, militias and constabularies, etc. which is why I referred to it and its antecedents. Contemporary accounts from the Land War, not those of the press or of upper class observers, but those reflecting the views of the common people are far harsher on the RIC. Universal loathing seems to be the main feeling. It’s not all Somerville and Ross. Would you have a problem with people commemorating their Irish relatives who were in the RIC and racing their history? No, not at all. In a private capacity that would be an entirely fair and creditable exercise. The State or any manifestation of the State commemorating (eg “honouring”) the RIC would be a different matter. Not even the Garda considering how it originated? And I have been reading about the RIC many prior to WOI were happy with the RIC – it wasn’t intil Redmond’s decline that things shifted. It seems to be any type of British force is immoral in the eyes of hard line And staunch Republicans. That’s a matter for yourselves however one which I won’t agree with as a liberal Naitionalist and many more like me. Given that An Garda Síochána is representative of the modern, independent nation-state of Ireland, any comparison with the foreign colonial police force which proceeded it would be highly inappropriate. Especially as the primary purpose of the colonial gendarmerie was to suppress any notions of Irish independence and nationhood free of foreign rule. Regardless of how many Irish men may have filled its ranks. As a liberal Nationalist in the North I celebrate both the Eastr Rsising and Battle of the Somme – would you say this is quite traitor like? Presumably yourself as a staunch Republican? No I wouldn’t because I have no problem with someone or some community celebrating either or both events. Most republicans don’t. It is the celebration of British Forces who served and fought in Ireland that we object to. There is a difference. Plus, the RIC were in relatively good terms with the population up until 1916 and really from 1920 it became a service renowned with B & Ts. Therefore the history of the RIC and the biographical information on the men is available based on fact. I recently purchased a book about the RIC, as I have always had a passing interest in Policing in Ireland, while maintaining a deep interest in the Irish Volunteers Pearse & Connolly. I have been reading about Irish Regular RIC men after disbandment. Many widows were jeered going to chapels in their communities due to their husbands held. So In fact Republicans can believe what they like but facts prevail.